Former SMHS and St. Maries Club wrestler Hayden Humphrey helped officiate at the St. Maries tournament Saturday. Cody Crane waits with his son Takodah. Takodah wrestled two matches at the St. Maries NIWL Invitational Saturday. Trace Chatigny and Zachary David watch a teammate's match matside. Troy Gamble watches for the ref's signal during the St. Maries Invitational Tournament Oct. 27. Troy wrestles in the bantam division and went 1-2 Saturday. Pre-bantam wrestler Boaz Newton works to take his opponent to the mat. Jayce Packer smiles as the referee counts nearfall points. William Johnson waits patiently matside for his turn to wrestle. William is a first-year athlete for the St. Maries Wrestling Club, participating in the pre-bantam division. Paizley Crane works to keep control of her opponent. Donald Johnson watches his teammates from the stands with his dad, Robbie. Donald wrestles in the Intermediate division for the St. Maries Wrestling Club and took fourth place at Saturday's tournament. Joseph Horton ties up with his opponent Saturday. 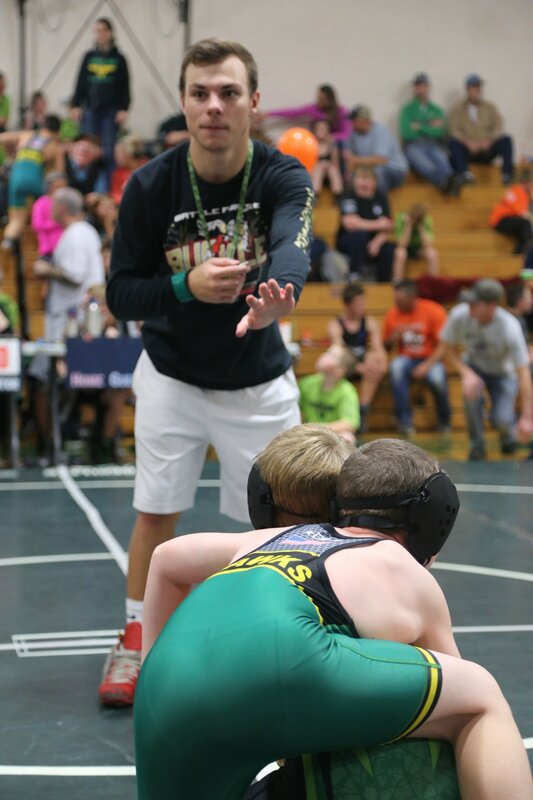 Jackson Kolar listens to his coach for instruction as his opponent prepares to get into position prior to the start of a period in a match Saturday. Eli Gibson gets a block from Cade Truscott during a regular season matchup with Orofino Oct. 19. The Lumberjacks travel to Pocatello Saturday for a quarterfinal game against Declo at 12:30 p.m. PST. Dani Curbow, first-year wrestler for St. Maries, listens to her coach during a match at the St. Maries NIWL Invitational Saturday. Former St. Maries Club wrestler Gabe Thomas (background) officiated the match. Takodah Crane, who participates in the Intermediate division for St. Maries, wrestles in his final match at Saturday's home tournament. Zack Sotin waits for the whistle. Brock Anderson finishes a takedown on his Lakeland opponent. 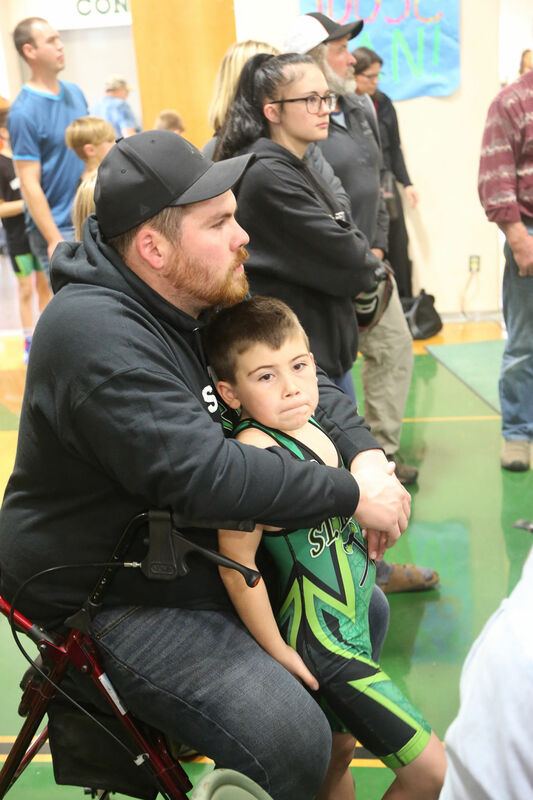 Josh Anderson (left) and Josh Harvey watch a St. Maries wrestler.